On Sunday 11th November 2018, the United Kingdom and its friends overseas will mark the day 100 years ago when the guns fell silent at the end of the First World War. 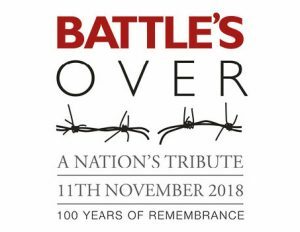 There are a number of opportunities to get involved, this is a chance for BB members to take part and pay personal and community tributes to those millions that gave their lives for their country or returned home wounded during or after the dreadful darkness of four years of War 1914 - 1918. Full details of how your BB Company can take part in this unique historical and important commemoration can be found in the Battle’s Over Guide which is available to download at brunopeek.co.uk/Battles-Over-Guide.pdf. The Boys’ Brigade along with young people from the Air Training Corps, Army Cadet Force, Sea Cadet Force, and the Light Infantry Buglers Association are being asked to play the Last Post at more than a thousand locations across the United Kingdom and Republic of Ireland. Specifically, The Boys’ Brigade is being asked to play at local Churches at 6.55pm on Sunday 11th November, followed by the ringing of the Church bells at 7.05pm (where your Church has bells and you can coordinate this with your Church). The organisers are looking to publish a list of the locations at which Buglers will play the Last Post (and ring the Church bells) and are therefore asking BB Companies to register their participation by 1st July 2018. To register your participation please email brunopeek@mac.com with your Company Name, Church Name, Church Address along with a Contact Name, Email Address and Telephone Number indicating if you will be taking part in playing the Last Post and/or ringing your Church bells. We hope to encourage as many Companies as possible to participate.